With a few exceptions, I love realistic looking art. But I also love color and so these Florentine statues usually catch my eye whenever we are shopping for images of our heavenly friends. They come in different sizes which is great for the budget and McKay Church Supply has one of the largest online selections I've seen. Many of ours were purchased from a Catholic book store that was closing it's doors several years ago although some were gifts. I have to admit that I wish their faces were more life-like and less child-like, but again, I love the colors and details on these statues. This next small set is a few Fontanini statues. Not pictured are the Holy Family Nativity set that is somewhere I can't find right now. I like these statues because I can put them in reach of small children and not be afraid. While not completely unbreakable, this polymer resin stuff sure is tough. My children have always been taught to be gentle and respectful when it come to handling religious images, but these are not so fragile that I would worry if a toddler got a hold of them and played with them. These are all different and vary in age, but I also love all white, or mostly white, statues. We even have an all white plaster nativity scene with gold accents that I just can't seem to replace. Every year, I think about it when the bright colored, beautiful nativity sets start showing up in stores, but the all white is simple, clean and beautiful. This last set is of the most recent additions to our collection. My mom was the first one to give us a Joseph's Studio statue and I can't tell you how in love I am with all of them! Lovely realistic images, beautiful colors, an antique feel!!! 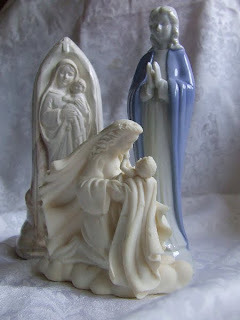 The First Communion statue was Grammie's gift to Sunshine and St. Anne belongs to Shortcake. We do try to limit our collection to personal family patrons or statues that mean something to us, but sometimes, the will is weak and beauty wins! Since All Hallows Eve is coming up at the end of this month, and my children's talk has turned to costume thoughts and plans for All Saints Day, feel free to share your images of heavenly friend with us. It might inspire them! Leave a link in the combox and I will update this post to include it. I like the Florentine collection, too. I have several as I used to carry them in my store. I think I have a bunch in the garage or attic that are leftover stock. I like their holy water fonts, too! Love your collection of heavenly reminders!!! I just wanted to thank you for all the wonderful coloring pages that you have to offer here on your blog. As the Coordinator of Religious Education and a Catechist at our parish, you have made my job easier and I ask God to bless you for your ministry here that you are offering to all his people. I just love this! We too have quite the cloud of witnesses in our home. This blog is great by the way--lots of excellent ideas. My little ones just love the coloring pages, and I've directed lots of friends here to find them! They are all beautiful. I have a collection of my own too. If you browse through some of recent post you can see some of them. And they vary in sizes too. 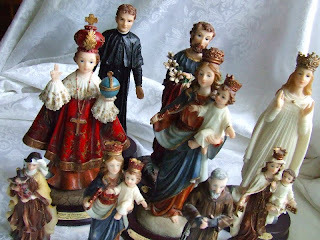 The tallest is St. Francis brought from Mexico a gift from my sister. The smallest St. Cecilia. We have not chosen a partical patron saint yet. They are all special too us. So jealous here. 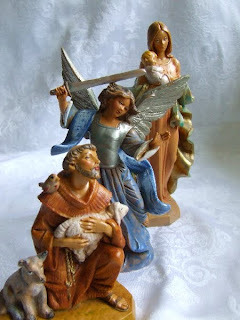 It is hard to find lovely statues here, and the postage from U S is well.....you get the picture. 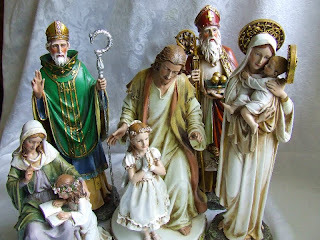 The girls and I have been eyeing off the St Nicholas, St Patrick and lady of Mt Carmel for a while and I am DESPERATE to get the St Anne one as well as the Madonna of the Street.